It has been said one can find anything on YouTube. I beg to differ. That is, unless, I am not so adept at searching the ‘net as I thought. Once the news broke this week of the passing of famed broadcaster, author and grammarian Edwin Newman, I wanted to do a personal tribute, if for no other reason than his devotion to the English language. 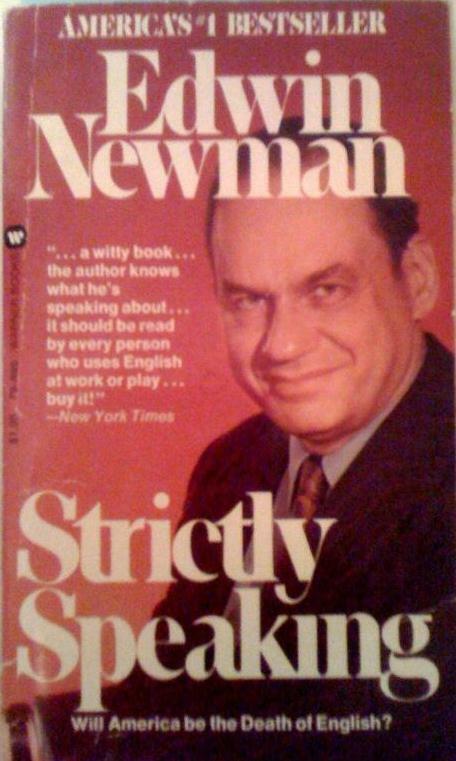 I even pulled out my yellowed copy of Strictly Speaking, but even that has already been mined for the best excerpts. In poring over volumes of obituaries and tributes, I did come across something I felt illustrated the blend of seriousness and humor for which he was known. On February 25, 1984, Newman hosted Saturday Night Live. On this show he performed a skit with Julia Louis-Dreyfus in which he manned a suicide hotline; she was the desperate caller. As he heard her plea for help, he interrupted her repeatedly to correct her grammar. I don’t recall seeing this particular skit, though I would have remembered because I too have been ridiculed for putting grammar ahead of substance, even in serious situations. So I’d really like to see the skit for myself. For three hours yesterday, I looked for a video clip or transcript, so that I could share it with you. I came up empty. So I issue this challenge. The first reader who can send in a link to a video clip of this skit—or can produce a transcript—wins a prize. Those of you who participated in and won my Aug. 14 Joint Marketing contest can attest that I make good on my promises. In the meantime, let us bid farewell to Edwin Newman, a man who served his profession with excellence and integrity, who stood up against the decline and abuse of the English language as he saw it. And who didn’t take himself too seriously to appear on SNL. Unbelievable, Monica! When you were barely two years old, you used to point to the TV and literally BEG to watch “Edmund” Newman. He was more popular with you than Bozo, and maybe even Captain Kangaroo. You’d stamp your little foot and demand him to appear! I suppose I should have recognized a gift of prophecy in your soul…somewhere. http://snltranscripts.jt.org/ is the amazon ordering page?? remember it is the 1983-84 season, not 1984-85. At that point Julia L-D returned,I think with another character,and asked what had happened while she was away,and he placidly mentioned that he had handled a call,and thought he had given the caller a new reason for living.